The 35 square kilometer sized ice island from Petermann Glacier PII-A has split into two pieces of about equal size over the last 4 days while moving almost 10 km per day to the south along the 150 meter contour of water depth. 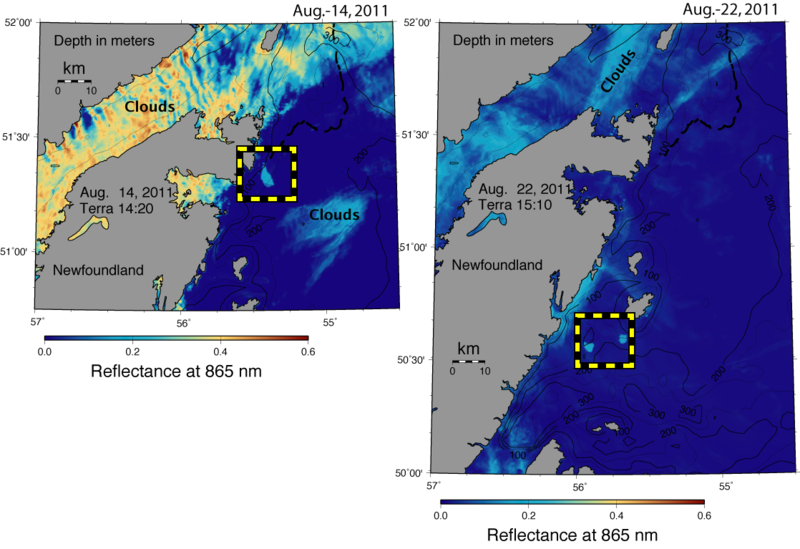 Petermann Ice Island PII-A as seen by MODIS/Terra as one piece on Aug.-14, 2011 and as two pieces on Aug.-22, 2011 (click to enlarge). It cleared the Grey Islands to its north and may now turn counter-clockwise around deeper water to the north of Horse Islands. The Canadian Ice Service continues to watch the many icebergs that PII-A has spawned all along the Great Northern Peninsula of Newfoundland with daily charts and RadarSat imagery. While the data from the NASA’s MODIS mission resides in the public domain serving a global community, the Canadian RadarSat is commercial product unaffordable serving only a select few. The two new ice islands should perhaps be called PII-Aa and PII-Ab. While their size no longer compares well to that of all of Manhattan, each is about as big as 5 Central Parks of Manhattan, or about 10,000 times my garden which is a third of an acre. This entry was posted in Ice Island and tagged Newfoundland, Petermann. Bookmark the permalink.